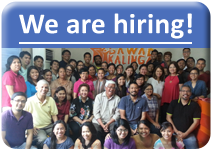 Gawad Kalinga Kalusugan builds towards healthy communities through the training of its residents and supporting priority health needs. Ten mothers die daily due to pregnancy and childbirth-related causes. 6 out of 10 Filipinos die without getting any medical attention. Four million children are malnourished and 50% of the population has no health care access. These saddening figures account for names, lives and faces. They all have families, dreams, and talents to give. Just like any other person who breathes, the poor have the right to good health and we exist to uphold it. Through SIGLA, we aim to empower the people in the community to look out for their own health. Health leaders are chosen among the beneficiaries and trained to become first contact health providers, counselors and mobilizers. This strategy is made possible by the financial support from partners as well as the technical skills and mentoring from health care experts and student volunteers. Through SERBISYO, we provide much needed health services in the form of tuberculosis (TB) treatment, Nutrition Program and PhilHealth Enrollment to name a critical few. Partners and health professionals come in to provide the sponsorship and technical skills needed. The trained health care workers in the community are also involved in the implementation and monitoring of these services. Through SISTEMA, we aim to establish a better health system and give better access to health services and facilities. Key to this strategy is our partnership with several institutions and local government units.